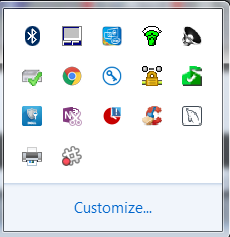 I'm having difficulty opening those Hidden Icons with Ranorex, when the Windows Task Bar is on Auto-Hide. How can I use Ranorex to open the Hidden Icons? Try "Win+B" shortcut and then "Enter". This should set focus to hidden icons toolbar and then expand it.